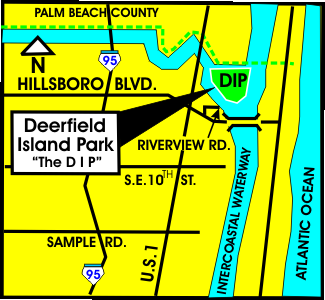 Welcome Friends of DIP (Deerfield Island Park) News & Events Did You Know? Deerfield Island Park is a feast for eyes and ears! 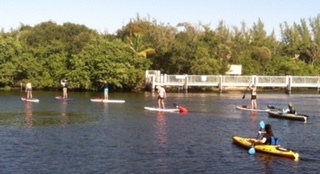 A peaceful and tranquil strip of land just north of Deerfield Beach and south of Boca Raton, Deerfield Island Park is a 56-acre nature-oriented park that offers passive outdoor recreational opportunities and environmental education for everyone. Not only is Deerfield Island Park home to as many as 100 plus bird species, it also serves as home to the endangered gopher tortoise and many other animals and plants..
Our mission is to increase the value to our community by raising funds for new educational programs and upgraded facilities, volunteering with projects to restore the natural flora and fauna, removing invasive species and acting as a voice for increased utilization of this “special” green space. Weekend Shuttles: A free park operated boat provides transportation to the island on Saturdays and Sundays hourly from 10 a.m. - 3 p.m. All shuttles leave from the dock at Sullivan Park. Last shuttle returns from the island at 3:00 p.m. Children ages 17 and under must be accompanied by an adult to ride shuttle. The shuttle is dependent on weather conditions, so please call Quiet Waters Park at 954-357-5100 to confirm the shuttle is operating if the weather looks questionable. 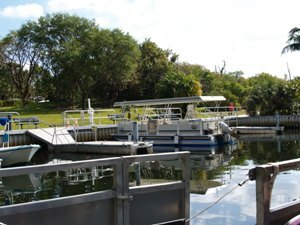 Private Boating: Marina access is also available for private boaters from 9:30 a.m. -4:30 p.m., Saturdays and Sundays. 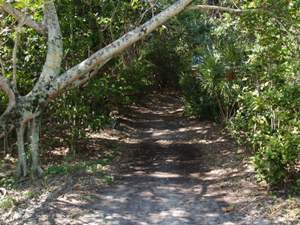 Nature Trails: A half-mile sandy and rocky Coquina Trail that meanders through coastal hardwood hammock and remnant scrub. 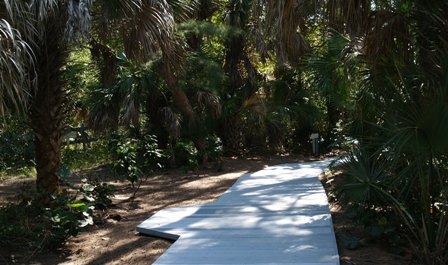 A Three-quarter-mile Mangrove Trail, partly through sand and partly over boardwalk through mangrove wetland. Free self-guiding maps for both trails available at the kiosks. Picnic tables and grills are located throughout park on a first-come, first-served basis. 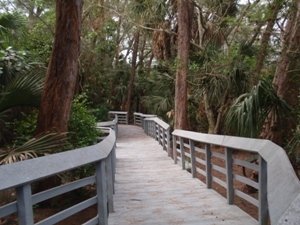 Two wheelchair-accessible boardwalks at two picnic areas. Map To The DIP: Take a DIP Into Nature! DIRECTIONS: From I-95 exit east to Hillsboro Blvd. At the last redlight before crossing the Hillsboro Bridge, turn left then immediately turn right onto Riverview Rd that takes you into the Sullivan Park and to the shuttle boat. 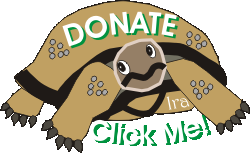 We are now an official charity wth AmazonSmile. Eligible purchases made through your Amazon Smile account will earn .5% for Friends of Deerfield Island Park. 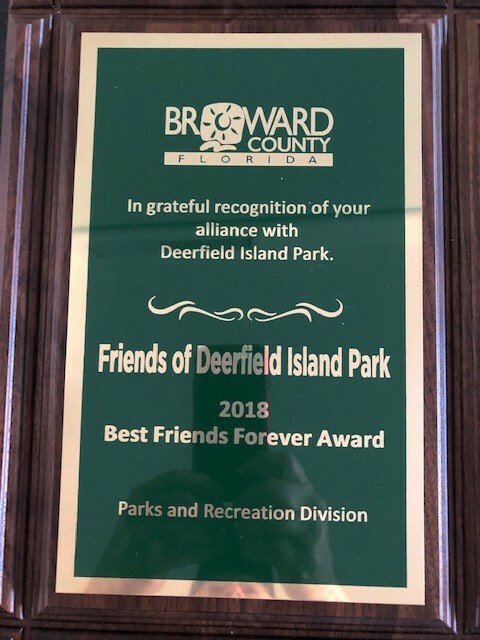 Friends of Deerfield island Park” were recognized on Thursday, February 28, at the 33rd Annual Employee meeting of the Browrd County Parks and Recreation Division. 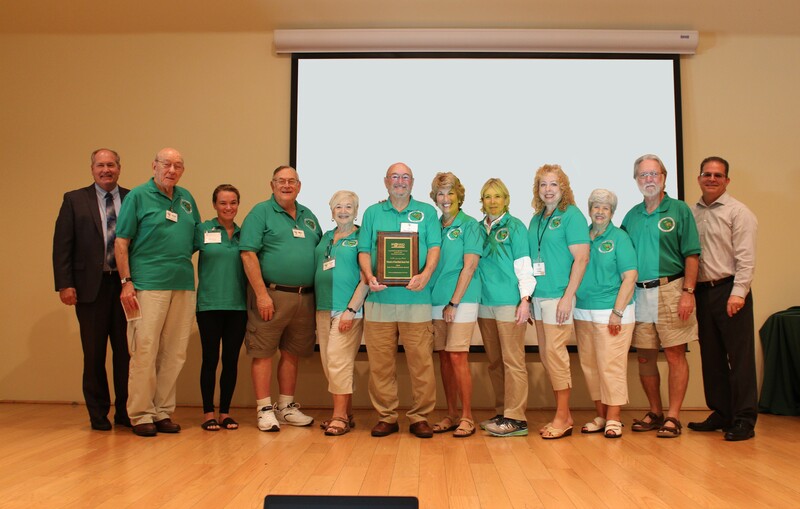 Dan West, Director of Parks & Recreation, presented Ira Wechterman, president and founder, with a “Best Friends Forever Award” to the group. They were singled out for their many contributions to the island including the purchase of benches, chairs, a kayak rack, an ambassador kiosk, and wingspan sculpture exhibit. The “Friends” group has also spent many volunteer hours on the island, helping to plant a butterfly garden, acting as ambassadors and tour guides, assisting in the creation of an experimental salt marsh, helping to replant baby mangrove plants, and developing educational projects for adults and kids who visit. Dan also pointed out that as a result of the renewed interest the group has created for the island, additional funding has become available for many long-awaited projects, such as reconfiguring the marina, and rebuilding the beautiful mangrove boardwalk that was destroyed by Hurricane Wilma. Although the group was created only 4 years ago, they have become a shining example of what can be accomplished when local residents work with county government to improve the quality of life in their community.